From the blog, "One Less Stone, How Can I Be Silent?" A year has passed since our precious brother was taken Home while serving in Iraq, and thoughts of him linger in our minds and we still speak of him so very often. Truly, Daniel was a man that you could write about, not because of how he died -- though he died a hero on a battlefield, and has taken his place in American history -- but because of how he lived. The door to the kingdom of heaven was opened to this child of God. If we could only see Daniel now -- in the words of his commander, enjoying his eternal life -- we would not grieve our loss, but make ready our own hearts in preparation to meet the Lord. And as it is appointed unto men once to die, but after this the judgment. (Hebrews 9:27) We all have an appointment. Daniel kept his appointment, as we also will. 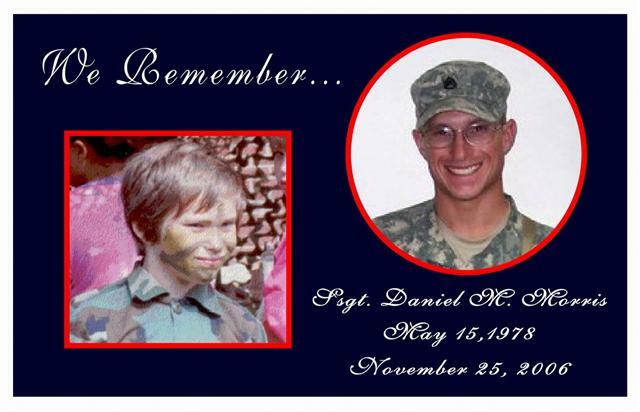 Daniel served the Lord while in the U.S. Army and had a strong Christian testimony before those he worked with. He never ceased to be a witness for Jesus in his daily life, and was an example of the believer before others. He expressed his desire to see not only his family, but his fellow soldiers touched by the Lord as he had been. In a world where many are disconnected from the needs of others, he had a true vision for the lost. We are so blessed to have had Daniel as a part of our lives. His smile made our world a little brighter. Amy, Daniel's mother, chose The Message Medley by 4Him to be played at his funeral. The lyrics below describe Daniel's life because he is A Man You Could Write About. To be crucified with Christ - Until all that lives through me is the message. There is a slide show at the blog link below. From the Blog, "One Less Stone, How Can I Be Silent"